I left Cairns so full of inspiration for both my garden and for the next collection of Hats by Felicity creations. The gardens in Cairns, similar to Broome, are so full of colour and plant variety and with the added magnificence of hatching butterflies. 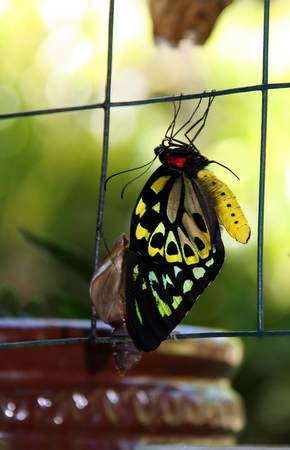 Amongst Jo’s beautiful gardens we watched the hatching of a Cairns Birdwing butterfly that completely begs the creation of headpiece in its honour. From Cairns I flew to Mount Isa via a touchdown in Townsville. Local Cloncurry Hardware owners Jill and Trevor found me at the airport (clearly identifying me by my pearl) and drove me an hour away to Cloncurry; delivering me safe and sound to my friends Shona and Brent Acton and son Ned. Tuesday night was the Ladies evening event at The Bower and this was a huge success. About 50 Ladies attended the evening of champagne, fabulous food and Hats by Felicity, organized by owner of The Bower, Penny Back and her fabulous friends. I was made feel so welcome and even presented with gorgeous gifts as a thank you for travelling so far. I sold 7 headpieces on the night and 11 creations in total before I departed Cloncurry and excitedly Penny and I will further develop our business relationship with a wholesaling arrangement of Hats by Felicity with The Bower from now onwards. The remainder of the collection is with The Bower, while I continue my journey, given the interest is still keen and ladies are still visiting the shop with their dresses to match for the upcoming local races in June; and in true Flic form, I spent the rest of my time in Cloncurry on nearby Fort Constantine Station getting my dose of cattle and station life. As most would know my time on remote cattle and sheep stations is from where the inspiration and beginnings for Hats by Felicity grew, with the recent story in the RM Williams Outback magazine generating the interest and opportunity to exhibit in Cloncurry. I love bringing the Hats story back to its beginnings and I am forever grateful for the chance to get back out bush. On Fort Constantine station I visited long time friend, Heidi Morris (nee Major) and her family. 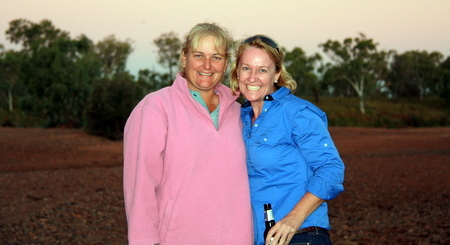 I first met Heidi in 1986 when we were both working on remote sheep station Salt Lake, 120 miles west of Bourke in NSW. I was the governess and Heidi was on the contract mustering team. A few years later I was Heidi’s bridesmaid when Heidi married Jack and I am god mother to their first son, Clayton, who unfortunately I didn’t get to see on this trip but I did get to meet their daughter, Emma and youngest son, Tom. It was about twenty years since Heidi and Jack and I had seen each other, so a great reunion at The Fort. Between Penny, Heidi and Shona my QLD trip was so wonderful and well organized that I didn’t miss out on seeing anyone, partaking in anything and most importantly I didn’t miss any essential mode of transport. Shona drove me to Mount Isa for my flight out to the NT, where I spent a few days in sunny Darwin which was a lot warmer than the 8 degrees I woke to on my last morning at The Fort. Thanks to all in Cloncurry, for such a wonderful visit and I look forward to my return, which is rumoured to be early next year. Wonderful Trip! Milliner on the Move nails it again! Awesome photos Flicka and I love the cows (of course) but the night looks so fun and everyone enjoying trying on your head pieces! Gorgeous.